Gor Mahia are set to play Harambee stars in a friendly match. Harambee stars are using the match to gauge their strength as they prepare to play Ethiopia in the return leg of the CHAN qualifiers set for this weekend. Harambee stars have a tall order as they try to reverse a 2-0 loss. They will need to score three clear goals. To this end, Stars coach Bobby Williamson has announced that he will be counting on Gor Mahia talisman Michael Olunga. “I am very impressed with Olunga’s form. He has been scoring some fantastic goals. “He was quite impressive against Chemelil Sugar and we expect to see him in the same form against Ethiopia,” said coach Williamson to the Standard. Williamson however warned against being too dependent on one player. “At the end of the day, it is a team effort and we cannot afford to rely on one player. He might get injured and then we will be in big trouble,” he added. To score goals, Stars will need motivation from passionate home fans. Williamson expressed his hope that fans will turn out in large numbers. “Our fans are very passionate and we know that their presence will play a big role in helping us go through. The FKF will need a strong marketing campaign to get despondent fans to turn up at the stadium. Aside from scoring, Stars must avoid conceding goals. The central defence has been jittery. The first goal Ethiopia scored was due to the inability of a Stars defender to deal decisively with a cross. And then there was Jackson saleh’s inexplicable handball in Congo. To shore up the defence, Williamson has called up the Gor Mahia duo of Haron Shakava, Musa Mohamed and Thika United’s Dennis Odhiambo. For Gor Mahia, this is chance to stay sharp since they do not have any fixtures this weekend. It is also a chance to provide players like Wycliff Juma, Timothy Otieno, Eric Ochieng and others a chance to fight their way into the starting line-up. Meanwhile players like Kagere, Nigiziyimana should be rested in anticipation of next week’s midweek fixture. A new report suggests that Paul Were signed for Gor Mahia at the very last moment of the transfer deadline. “It’s official Paul Were is our player now after signing a six month contract with us”, confirmed Jolawi Obondo on the club’s site. There are two days left in the mid season transfer season and Gor mahia are still trying to sign Amazulu winger Paul Were. Though the club decided to release him after they were relegated, they have yet to agree to formally release him. “We are still in talks with Were. There are a few loose ends need to tie up. The problem is from Amazulu who are yet clear with the player,” said Killo to supersport.com. The speedy Were hardly played while at Durban based Amazulu and spent most of his time on the bench or the terraces. Killo says that talks are at an advanced stage pending action from Amazulu. “At this point, i can only say we are at 60 percent in the talks. The player has accepted all the terms. Lets see how things go by the end of the day on Monday. We will have a word for you on Tuesday,” added Killo. “It will be great to have Were in the squad as we face Ethiopia. He brings in a lot to the team and his presence will give us plenty of options upfront especially as Jacob Keli has gone to Zambia,” said Williamson to the Standard. Were scored Kenya’s goal during the 2017 AFCON qualifier against Congo. He can play on either wing and is a handful for defenders due to his pace on the ball. “Sserunkuma is a very good player and we had hopes of getting him back but from the look of things that will not be happening as we approach the mid season deadline of midnight yet he has not availed himself as we thought,” Jabuya told supersport.com. The return of their prodigal son would have bolstered City Stars who appear destined for relegation being placed second from bottom. Any thoughts that Gor Mahia would take their foot off the accelerator after their superb first leg were quickly banished at Afraha stadium on Saturday when Gor Mahia methodically demolished Chemelil Sugar 4-1. First off Michael Olunga made history when he scored four goals in one match. This author cannot remember the last time a Gor Mahia player scored four times in one match. One might have to go back to the free scoring days of players like Hezborn Omollo, Maurice Ochieng “Sonyi” and Ouma “Chege”. Indeed this season is starting to look like the 1984 season when Gor Mahia scored in incredible 80 goals. The accuracy and poise with which Olunga took those goals is something to marvel at. But each of those goals were the result of well constructed moves and accurate assists. Olunga must thank his team-mates because these were all team goals. “It is a good omen to start the second leg like this. In fact, it has given us a lot of morale and we are determined to do even better,” Olunga said to the Standard. Even Olunga seems to understand that this was a superb and tactically astute team effort, Which brings us to the second point. Coach Frank Nuttall showed once again that he is a master chess player. Chemelil appeared to have found a formula for stopping Gor Mahia in the first half. They had much of the possession, they stifled Gor Mahia strikers and had several attempts on goal in the first half. But whereas coach Mururi stuck to his first half switch, coach Nuttall made a number of tactical changes which sliced open the Chemelil Sugar defence in the second half. The ability to think quickly and make adjustments according to the flow of the game is what separates excellent coaches from ordinary posers. Gor Mahia are still 12 points atop the standings with an incredible 34 goals scored and only 7 goals conceded. This season has seen some amazing performances for Gor Mahia. There was the classic goal by Kagere against All Stars. There is the sudden emergence of Ali Abondo as an international calibre player. And you cannot forget Collins Okoth’s ascendancy to captain of Harambee stars. There is also the fact that four out of the top three leading scorers in KPL are from Gor Mahia. And of course Olunga’s heroic performance on Saturday and more yet to come. The way Gor Mahia are playing now, we should start seeing the kind of crowds we saw in 2010 and 2011. Michael Olunga scored four times as Gor Mahia hammered Chemelil Sugar 4-1 at Afraha stadium Nakuru. 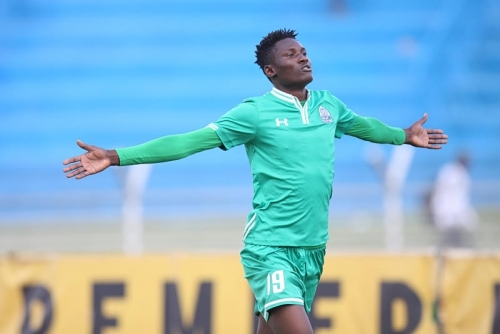 Michael Olunga was the star of the match scoring four goals as Gor Mahia drubbed Chemelil Sugar 4-1 in a Kenyan Premier League match played on Saturday 27 June at Afraha Stadium in Nakuru. The youngster opened the scoring for the champions after 36 minutes of play but the hosts responded three minutes later as the two sides left for a breather with scores level.The second half was dominated by the Green Army with Olunga scoring three in a span of 27 second half minutes. Chemelil Sugar started the game as the stronger side with Stephen Wakanya and Stephen Kariuki forcing Boniface Oluoch on Gor Mahia goal into early saves in the match. Daniel Murage also had a chance to break the deadlock in the 6th minute, he cut in from the left and unleashed a ferocious shot from inside the area but Oluoch was equal to the task parrying the ball out for a corner. Gor’ first clear cut chance came on the 13th minute with Michael Olunga connecting to a Sibomana cross but Jairus Adira on Chemelil goal was equal to the task easily picking the ball. Olunga had another chance to break the deadlock on the 19th minute,he received the ball from midfield and with a fantastic turn put himself through on goal but Adira once again was equal to the task blocking the striker’s shot for a corner. Adira made it a hat-trick of saves against Olunga on the 26th minute denying the former Thika United man who headed direct on goal from an Ali Hassan Abondo corner. Olunga finally got the breakthrough on the 36th minute, he received a precise pass from Karim Nizigiyimana on the right controlled the ball and fired into the bottom right corner to give the champions the lead. Chemelil responded three minutes later through Alloys Mangi, Daniel Murage on the left looped the ball over an advancing Boniface Oluoch, the ball hit the cross bar and bounced back to the field of play and Mangi who was unmarked on the right headed into an empty net to draw the Millers level. Gor showed more after the breather and got two goals in a span of three minutes through Michael Olunga. On the 56th minute, the player received a pass from strike partner Meddie Kagere finishing past Adira who was out of his position for his second of the match. He completed his hat-trick three minutes later looping the ball over advancing Adira with a fantastic back foot flick to give Gor a two-goal buffer. Meddie Kagere thought he scored his 10th of the season in the 78th minute but the goal was disallowed as he was adjudged to have been in an offside position, he had another chance two minutes later but failed to connect to a Walusimbi cross from the left. Michael Olunga grabbed his fourth goal of the match finishing past Adira to complete the rout. Starting XI :23. Bonface Oluoch. 5. Musa Mohamed. (85’ Bernard Odhiambo) 14. Karim Nizigiyimana. 3. Abouba Sibomana. 29. Innocent Wafula. 30. Ali Abondo. (80’ Eric Ochieng) 18. Harun Shakava. 22. Meddie Kagere. (86’ George Odhiambo) 2. Godfrey Walusimbi. 19. Michael Olunga. 10. Khalid Aucho. Gor Mahia are back in the hunt for the 2015 Tusker Premier League. This Saturday they take on Chemelil Sugar in an away fixture at Afraha stadium. The match is being played at Afraha because the stadium in Kisumu has banned because of its flimsy perimeter fence that is easily torn down by fans leading to pitch invasions. Gor Mahia will be looking to pick up from their solid form in the first leg where they did not concede a goal in ten games and convincingly. And judging from the way they dispatched Langata Gremio in midweek match, Gor Mahia are focused and have not lost any sharpness unlike last season when they shockingly lost to GFC 105. In action for Kogalo this weekend might be new signing Enock Agwanda who is the only player Gor Mahia signed. Paul Were’s move did not happen because his South African side is still interested in his services. Dan Sserunkuma’s return was foiled by a new KPL rule that limits the number of foreigners to five. While Rama Salim was approached by club officials but did not show any interest in returning. Agwanda says he is ready to produce on the field. “I have held enough training sessions with the team and even though the squad is yet to be named, I am ready for action if called upon,” he said to the Daily Nation. In past years, Gor Mahia have signed strikers who though they excelled at other teams, were unable to perform under the high pressure environment that is Gor Mahia. One classic case is Ezekiel Odera who joined the club in 2011 after having been the second leading scorer in the 2010 KPL. He was unable to produce the same form at Gor Mahia. But Agwanda has said that the pressure does not bother him. “Fear the fans? Even when I was at Sofapaka they still had fans but I used to score against them so what is there to fear? What is important is to deliver on my duties and grow in my career. Those are the things I am focusing on,” he said. During the first leg, Gor Mahia won 3-1 and thus silenced Chemelil coach Mike Mururi who had insinuated that referees were helping Gor Mahia. Fans will be looking for the same on Saturday. There were no upsets this time as Gor Mahia started their GoTV shield campaign on a sound note beating Langata Gremio 3-0. Gor Mahia cruised to the second round of GOtv Shield tournament after seeing off Langata Gremio 3-0 in a match played at City Stadium on Wednesday. 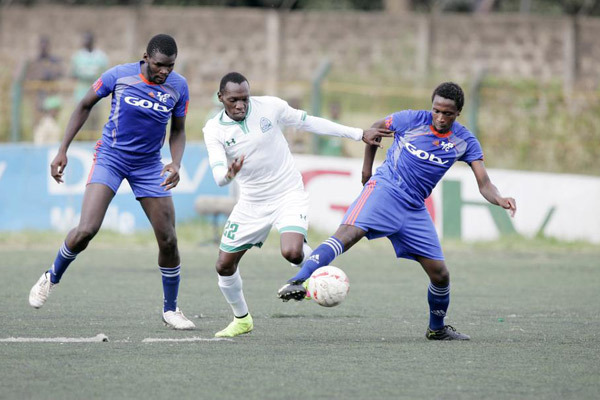 Goals from Meddie Kagere, George ‘Blackberry’ Odhiambo and Liberian defender Dirkir Glay were enough to send K’Ogalo through as they remained in contention for a league and domestic cup double. Gor Mahia assistant coach Frank Ouna opted to rest regular starters with custodian Boniface Oluoch paving way for skipper Jerim Onyango. Musa Mohammed also returned from injury to marshal the defence alongside Glay, Karim Nizigiyimana and Abouba Sibomana. Ernest Wendo was handed a start in the midfield alongside Eric Ochieng’, Ronald Otieno and George Odhiambo. K’Ogalo started off well with Kagere terrorizing Gremio’s rear guard. In the 10th minute, Kagere put Gor Mahia ahead after capitalizing on a mistake by Gremio goalkeeper to tap home from a rebound. Gor Mahia should have stretched their lead three minutes later but defender Nzigiyimana failed to convert from the penalty spot. With the penalty save, Gremio tried to come into the match and forced Jerim Onyango to a nice save in the 20th minute. The lower league side were determined to shock the league champions but they looked nervous when approaching Gor Mahia’s danger zone. Gor Mahia went close again in 23rd minute as Omino failed to score after being put through by Musa Mohammed. Kagere should have doubled Gor Mahia’s lead and grab his second of the day at the stroke of half-time but watched helplessly as his bicycle kick from George Odhiambo’s close was saved by Gremio goalkeeper. On resumption, Gremio continued to contain Gor Mahia, who resorted to slow down the game. Ronald Omino missed another chance for Gor Mahia before ‘Blackberry’ powered home the second goal from a goalmouth melee. Another chance for Gor Mahia went begging minutes later as Timothy Otieno shot wide while Innocent Wafula failed to score from an open chance. Glay then calmed Gor Mahia’s nerves grabbing the winning goal in 79th minute and thwarted any lingering hopes of Gremio making a comeback. Gor Mahia coach Frank Nuttall is set to return on Friday after a well deserved holiday. This means he will miss the GoTV shield match against Langata Gremio and will not play much of a role in preparing the team for the clash against Chemelil on Saturday. However team official Ronald Ngala says there is no cause for alarm. Israel Emuge, Charles Bruno and Jerry Santos have all been released by the club. Neither player has featured much for the club this season. Bruno who was signed in the middle of 2014 played a key role for the club and acquited himself well when the club was beset with departures and injuries. Bruno who joined from Thika United was once a very promising player who even attended trials in Italy after he played for the Kenya U-17 side. He will thrive at SoNy Sugar where he can play with no pressure. Emuge for his part has been very solid when on the field but is often injured. Jerry Santos hardly played for Kogalo. He had seen the writing on the wall long ago and started to train with Posta Rangers. SoNy Sugar are keen on signing Charles Bruno. 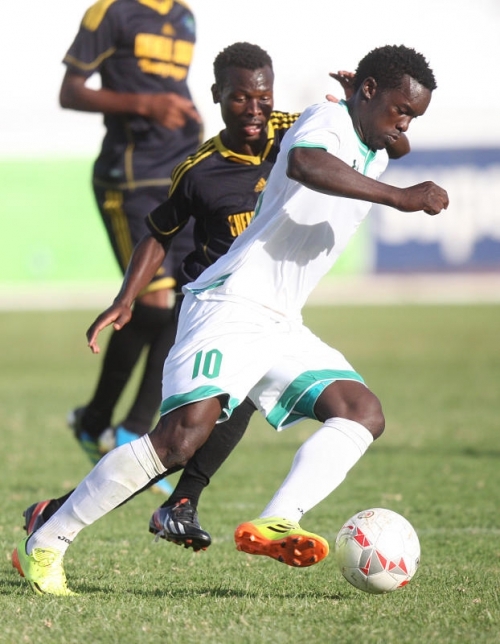 The departed trio joins Kevin Oluoch who has joined Muhoroni, leaving Kogalo rather thin in the centre back position. After finishing the first leg and after a long international break that saw several Gor Mahia players participate in AFCON qualifiers for various national teams, Gor Mahia will now shift their focus to the GoTV Shield. Kogalo will kick off their 2015 campaign against Langata Gremio on 24th June (Wednesday) at City stadium starting 3pm. Those players who only played in the AFCON qualifiers such as Sibomana and Glay will likely have rested enough to play against Gremio. However those who traveled to Ethiopia will likely need more rest. The technical bench will have to be judicious about giving players adequate rest, after all the primary goal of Gor Mahia this season is to win the league. Squad rotation is a critical pillar of success because it allows players to get sufficient rest and reduce the incidence of injuries. Nevertheless Frank Ouna suggested that the players would only be given one day rest. “A number of our key players will be involved for their national teams and so, they will have Monday as resting day before we prepare for the GoTV match to be played on Wednesday,” said Ouna to the club site. Some players need not only physical but also psychological rest. Boniface Oluoch has had a torrid time being pilloried by various media outlets. He probably needs some time off to get in the right frame of mind for the resumption of the league campaign. In any case Gor Mahia has a perfectly capable backup goalkeeper in Jerim Onyango who has not played much this season but appears content to be the backup keeper. “Many have spoken about my lack of play time at the club this season but as a team player and captain I have to say that I am proud of the overall performance by my teammates. Achieving what we did in the last six months needs team effort and that is what we got. “We shall continue working as a team and when called upon I will represent K’Ogalo just as I have done in the last five seasons. The competition has brought out the best of me and I feel I am in the best shape ever. I want to play, that’s my goal. But sometimes you have to be patient; if there is an opportunity I want to play as well as I can and help the team.”said Jerry Jagoal to the club site. Another player who deserves rest is Michael Olunga. The dependable scorer has played in the Olympic qualifiers, AFCON qualifiers and CHAN qualifiers. Perhaps this is an opportunity to rest Olunga for the league and give players like Timothy Otieno, Blackberry and others a chance to prove they are worth a place in the starting line-up. Musa Mohamed and Haron Shakava were also dropped from the CHAN squad due to illness and/or injuries. Rushing them back into the playing field may be ill-advised. In their place Gor Mahia can deploy Dirkir Glay who is fresh from the mammoth tasking of marking Emmanuel Adebayor. Not much has been seen from Bernard Odhiambo who looked very promising during pre-season friendlies. Pairing him with experienced players like Glay and Sibomana could be a useful growing opportunity for him. Kenya’s Harambee stars lost 2-0 to the Walya Antelopes of Ethiopia in the opening qualifier for the 2016 CHAN. Kenya has a terrible record in this tournament having fallen to the likes of Burundi, Ethiopia, Uganda and Rwanda. They appear destined to suffer the same fate this time around despite decent preparations. The goals that sunk Kenya were scored by Asechalew Girma in the 23rd minute and Gatoch Panom in the 77th minute. Both players play for Ethiopia Coffeee. The first goal was a result of a poor clearance by a Kenya defender. The second Ethiopia goal came from a penalty. The Harambee Stars had a chance to reduce the score but unfortunately, Kevin Kimani saw his penalty kick in the 79th minute saved by Tarik Getnet. Coach Bobby Williamson now has a tall order in the return leg. His side has to win by three goals and concede none. Conceding any goals will spell doom for Kenya as they will likely lose on away goals rule. Also in action was Boniface Oluoch and Michael Olunga. Ali Abondo came on as a substitute.